Alongside those in official positions of authority, key political advisers, lobbyists, strategists and corporate representatives have also played a crucial role in the ideological and political justifications and legitimization sought and falsely proposed in order to execute the overall policy embraced, inclusive of an accumulated pattern of attacks, military and otherwise, that has lasted 19 years to date, culminating in the 2003 illegal war of aggression waged on Iraq and that continues to be executed despite wide and ongoing condemnation. Though there are nuances of responsibility inherent to the nature of policy construction and execution, the personal relations and interconnections between primary and secondary level individuals involved, and the groups or common circles to which they belong, testify to a large degree of cohesion present in intent and action among the respondents identified and those who support and benefit from the policies they have pursued. At the least, this shared intent is one of deliberate harm; at worst, it amounts to an objective intent to destroy for definable, and at times publicly enunciated, strategic, geopolitical and geo-economic reasons. Furthermore, none of the respondents can reasonably claim they did not have knowledge of the likely outcome of their policies, and those they supported, as all had not only participated in the design and execution of these policies, but they continued to execute said policies once their effects were widely known and had been proven to be detrimental to — and destructive of — the health, sovereignty and rights of the Iraqi people, and further have defended these policies and in majority continue to do so. Such massive destruction of life, having as context a 19-year period of accumulated attacks, with numerous warnings and opportunities for remedy and a reversal of policy ignored, cannot be mere happenstance. Indeed, the paramount charge that must be investigated, and that plain fact evidence suggests, is that this level of destruction has been integral to the US and UK’s shared international policy for Iraq. 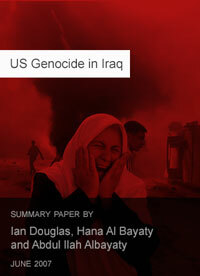 The destruction in whole or in part of the Iraqi people as a national group, and depriving this group of all or the majority of its rights, appears from a reasoned account of the catalogue of violations, abuses and attacks to which the Iraqi people have been subject to be the unlawful means pursued purposely by the respondents in order to redraw by force the strategic and political map of the Arab region and Iraq’s place within that context, and to capture, appropriate and plunder, via the cancellation of the sovereignty of the Iraqi people and the destruction and fragmentation of their identity and unity as a national group, Iraq’s substantial natural energy resources. Historically, the Iraqi national group, variegated yet cohesive, was and continues to be, despite the aggression faced, firmly rooted in its overwhelming majority in the concept of citizenship of the Iraqi state — a state founded on public provision of services and a nationally owned energy industry. The policy that the respondents have sought and continue to seek to impose, that has entailed privatizing and seizing ownership of Iraqi citizens’ resources, along with the administrative and political partition of the former unitary state, is contrary to the basis of, and cohesion of, the Iraqi people as a national group.